Is the WiFi on your 3GS iPhone no longer working? Unable to connect to WiFi networks? If so this is the in house repair for you we will repair the WiF on your iPhone 3GS logic board and restore the unit back to full working order. Please read through the symptom list below to confirm your fault matches one of the listed descriptions. Faulty WiFi 3GS Symptoms are as follows with it usually being one specific example from the below, your iPhone 3GS WiFi is not working consistently. 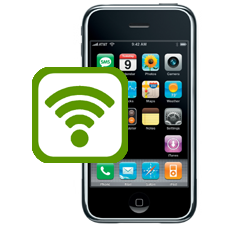 Your iPhone 3GS WiFi intermittently finds and loses network connections. Your iPhone 3GS WiFi finds the network, but does not connect. Your iPhone 3GS WiFi will connect to network, but does not accept any password even when correct it will continue to repeat password entry requests. Your 3GS WiFi connects to network but drops the connection after a very short time. Checking the following Settings > WiFi > Network shows no device MAC address and has blank fields.